A model of this new American student diversity is right under our noses, which might surprise people outside Iowa. In Des Moines, the public school system has been “minority majority” since 2011. National Journal discovered this last month, writing that the school district could be a “model for urban schools” in blending students that speak 100 different languages and dialects and come from Myanmar, Mexico, Thailand and more than 20 other countries. The Des Moines school district is unusual in Iowa in terms of diversity. The state is predominantly rural, and, as in other rural areas of the U.S., there is less ethnic diversity than in urban areas, while the politics tends to trend conservative. In fact, politically, Iowa has had an interesting mix of progressive and conservative elected officials. It was the state that gave Barack Obama the initial boost he needed to win the Democratic primary in 2008. In the recent election, however, Iowa went a different way, replacing one of the most progressive U.S. Senators, Tom Harkin, with a political newcomer, Joni Ernst. She made a splash in the early days of the campaign by touting her farm experience castrating pigs, which she said would be helpful in “cutting pork” in Washington, D.C. Although she focused her campaign on her Iowa farm roots, critics have pointed to the variety of far-right views and conspiracy theories she has embraced in the past. After her election, she commented that she was looking forward to going to Washington and “making them squeal”. Let’s hope that she learns from the experience of the Des Moines school district, that it’s possible to work together with people different from you in fundamental ways, and that it would be good to shift her rhetoric from castration to cooperation. Maybe barn raising would be a good farm symbol for what the U.S. political system needs today. Over the last few years, there have been a number of calls for more people to learn computer programming. President Obama made such an appeal last year, and last week Tim Berners-Lee, the inventor of the World Wide Web, called for politicians themselves to learn to code. Not, he said, because we want them to spend their time writing software code, but because we want them to be able to make informed decisions about laws involving technology. This is the primary mover behind the “learn to code” movement, namely that networked computers have become such a central and vital part of contemporary society that it it’s not enough just to know how to use them, we need as well some insight into how they work. This is important in being able to conceptualize how technology can be applied to problem-solving and to understand what might be involved in programming computers or creating apps to deal with issues as they arise in the future. Giving children an early experience with coding puts them into a position to understand that side of their future lives, not to mention, providing possible job opportunities in a rapidly developing field. England in 2015 will be initiated computer programming in the school curriculum for all children from ages 5 to 16. Estonia is already teaching programming in the early years of primary schools. 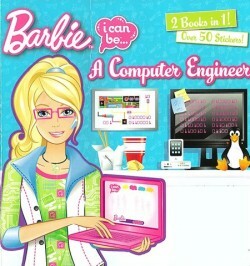 That’s right, Barbie of course can’t actually write the code – she needs boys to do that. As a blog post from Pamela Ribon details, things get worse from there. It turns out that Barbie has infected her own and her sister’s computers with a computer virus and that she has little clue what to do, or other basics of how to work with computers. Clearly, this is not the model we’re looking for our young people to emulate. Given the outcry over the overt sexism on display here, Mattel today apologized and announced it is pulling the book from circulation. How in the world it ever got published in the first place is something I hope Mattel will explain.